Despite many upgrades and improvements over the years, the Calumet Colosseum (seen here in the 1920s) has been able to maintain its historic charm. Near the northern tip of Michigan’s Upper Peninsula, in the heart of an area known as the “Copper Country” due to its long history with the mining industry, you’ll find a simple, single sheet of ice that boasts a hearty hockey history. There, in the small, blue-collar town of Calumet, stands a rink featuring turn-of-the-century charm, eye-catching architecture and a lobby wallpapered with photos of local teams ranging from pre-World War I to the present day. That rink is the Calumet Colosseum, a structure built in 1913 that is regarded as the oldest continually used rink in North America, and continues to serve as a point of pride in this hockey-crazed community. In a day and age when arenas built in the 1960s or 1970s are often considered outdated, the Calumet Colosseum continues to draw praise from locals and visitors alike due to its old-timey charm. “The history that the building holds within its walls is remarkable and tells quite a story of both the progression and development of hockey within the area,” said Amy Richards, who has four children in the Calumet Hockey Association. 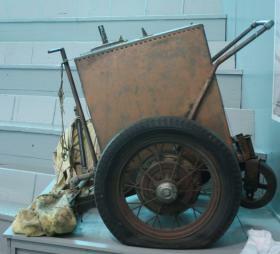 Construction on the facility began in 1913, A homemade handcart from the 1960s is displayed inside the arena.with the first official game being contested in early January 1914 between the Calumet Wolverines and the Portage Lake Pioneers, a pair of senior league men’s teams. Originally owned by a series of private investors, the Colosseum was sold to the State of Michigan in 1942 following a fire at the local National Guard Armory. In need of a new home for the outfit, the state purchased the building and changed its name to the Calumet Armory. 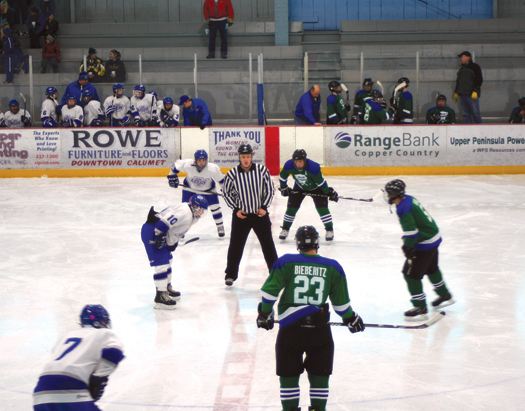 For the next 60-plus years, the Calumet Hockey Association would lease the ice surface each season from October to April. In the summer of 2005, Calumet Township traded 12 acres of property, on which a new National Guard Armory would be built, in exchange for ownership of the rink, and promptly switched the name back to the Calumet Colosseum. With a moniker like the “Copper Country” it’s readily apparent that the area has always been strongly tied to its copper mining heritage. In fact, the local high school still pays homage to those roots by referring to its sports teams as the Calumet Copper Kings. That bond was further strengthened in 1968, when the Colosseum first installed artificial ice. At the time, the foundry for the Calumet and The many photos within the Colosseum’s lobby serve as a nod to the rink’s storied history.Hecla (C&H) Mining Company was located directly across the street from the Colosseum. A major player in the mining game for more than 100 years, C&H was in the midst of an employee strike that would eventually shut the company’s doors for good. Clusters of striking miners would picket outside the foundry in the mornings, and eventually many of them – promised no more than lunch and coffee – walked across the street and worked all day to install the Colosseum’s new artificial ice. “We had pipe fitters, welders, refrigeration guys; every kind of person you would need to put something like this in was available to us free of charge,” said Bob Erkkila, a local sports historian. With the added assistance, the entire rink was welded in just five days – a process that would normally take a month to complete. As with any structure that’s a century old, the Colosseum has provided locals with countless memories and stories. You could start with Paul Bracco, who was kicked out of the arena back in 1950 after attempting to sneak into a game, but was shortly thereafter given a job as a sweeper and proceeded to work his way up the ranks to his current role as rink manager. Or you can chat with Calumet Township Supervisor Paul Lehto, who has worn many hats during his 50-plus year association with Calumet Hockey, including time spent as a player, coach and general manager for various teams. One of Lehto’s favorite memories came when he was coaching the Calumet Wolverines in the mid-1960s. Leading up to a Gibson Cup Final game against archrival Portage Lake, the local authorities were forced to step in when more than 2,000 people attempted to pack into the snug arena. And although nearly $1 million has been spent on improvements to the arena over the past few years, including a new furnace, an elevator and three new locker rooms, there’s been a concerted effort to uphold the traditional look and feel of the Colosseum. “We’ve tried not to alter the building more than we’ve had to. That’s always been a goal of ours,” Lehto said. 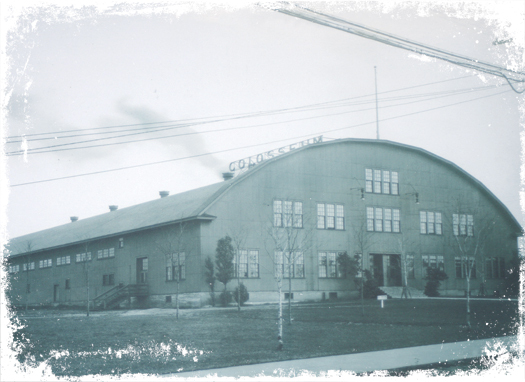 As it closes in on its 100th anniversary, the Calumet Colosseum continues to provide a home for the next generation of hockey player. Here the The Calumet Copper Kings junior varsity team, now in its third year, takes on Marinette/Menominee. That commitment to maintain the Colosseum’s history has been greatly appreciated by the locals. “It’s nice when you can come to a rink where it’s basically the same as it was when you started as a kid. To be such a good rink without having anything changed, that’s what makes it special,” said Josh Frantti, who played in the Calumet Hockey Association and now serves as head coach of Calumet’s junior varsity squad. 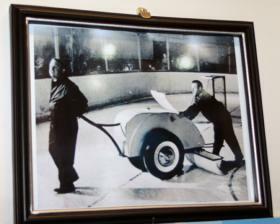 In the vein of keeping with tradition, the rink will celebrate its 100th year of operation in January 2014 by having the Calumet Wolverines take on the Portage Lake Pioneers in a game that will take place 100 years to the day after those two clubs skated in the first-ever sanctioned contest at the Colosseum. The centennial celebration will also feature a special treat, as the Detroit Red Wings alumni team will play in an exhibition game. It seems fitting, that even after 100 years of change, including facility upgrades and technological improvements, things remain very much the same. And that’s part of what makes the Calumet Colosseum so special. Craig Stancher is a former Brian Fishman Intern and is the current marketing specialist at Northcentral Technical College in Wausau, Wis.
> The George Gipp Senior Athlete Award was established at Calumet High School in 1934 and is annually awarded to the school’s top male athlete. > Heartley “Hunk” Anderson, a Calumet native who was Gipp’s football teammate at Notre Dame, replaced a pair of legendary gridiron coaches after his playing days had concluded. Anderson took over for Knute Rockne at Notre Dame in 1931 and then replaced George Halas as head coach of the Chicago Bears in 1942. > The International Frisbee Hall of Fame has been located in the second floor ballroom of the Calumet Colosseum since 2011. > The MacNaughton Cup, which is awarded annually to the WCHA’s regular season champion, is named after James MacNaughton, the former president of the Calumet and Hecla Mining Company. MacNaughton, a major supporter of amateur hockey, purchased the trophy in 1913 and then donated it to the president of the American Hockey Association with the purpose of awarding it to the league’s champion at the end of the season. From 1933 through 1950, only teams from the Copper Country competed for the trophy. Dee Stadium, also called The Dee, is located on the same site as the Amphidrome, which is regarded as the birthplace of professional hockey, and is the seventh oldest indoor ice rink in the world. Its first game was played on Dec. 29, 1902, between the Portage Lakes Hockey Club and the University of Toronto in front of 5,000 spectators. For the 1903-04 season, Portage Lakes became the first hockey team whose players were all paid, and was a charter member of the International Hockey League. Fire destroyed the Amphidrome on Jan. 9, 1927, and the New Amphidrome was built the following year. In 1943 it was renamed the James R. “Dee” Ice Stadium when the Michigan College of Mining and Technology (now Michigan Technological University) purchased it. Michigan Tech played its last hockey game in the Dee Stadium on Jan. 13, 1972. 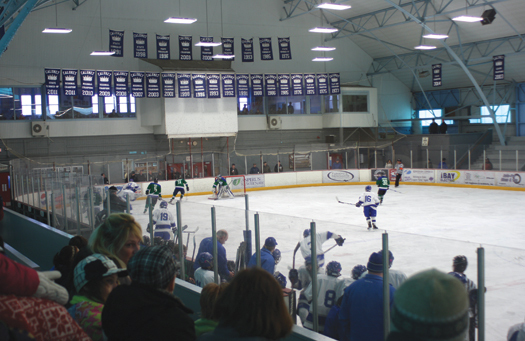 It is the current home of the Houghton High School hockey team and Portage Lake Pioneers senior hockey team. Aviator Sports and Events Center is located on the grounds of New York City’s historic first municipal airport, Floyd Bennett Field, which opened its hangars in 1931 and was decommissioned in 1972. Many of the original airport structures and runways are listed as a historic district on the National Register of Historic Places for their contribution to the nation’s early aviation history. Housed in a former airplane hangar, the Aviator Sports & Events Center includes two NHL-sized rinks along with a full-service fitness center, gymnastics, meeting and events rooms. It was the home of the Brooklyn Aviators of the Federal Hockey League from 2009 to 2012. The Eveleth Hippodrome is not only one of the oldest rinks in the country, built in 1922, it is also the home of some of the greatest players in USA Hockey history, from Frank Brimsek to John Mayasich, John Matchefts to Mark Pavelich. The first game in the Hippodrome was on Jan. 1, 1922 before a packed house when the Eveleth Reds defeated the Duluth Hornets, 10-6. Once referred to as the “Madison Square Garden of the Northland,” the Hippodrome has undergone numerous upgrades and renovations over the years. The Hippodrome originally used “natural ice,” but in 1950 added refrigeration, concrete flooring, and artificial ice. Today the Hippodrome is home to the Eveleth-Gilbert Golden Bears. The spirit of Hobey Baker lives on in the rink that bears his name. Built in December 1921 in memory of Princeton University’s greatest athletic hero, Hobart A.H. Baker, the historic barn maintains the old-world charm that fans enjoyed from the first drop of the puck. It has undergone several upgrades and renovations through the years to give the Princeton hockey teams a modern and top-notch facility. The lobby features photo montages and trophy cases that pay homage to the history and tradition of hockey at Princeton, that includes the legacy of both Hobey Baker and Patty Kazmaier, who led the Princeton women’s team in the early 1980s and is honored with an award given to the top player in women’s Div. I hockey. Home to the University of Michigan ice hockey team, Yost Ice Arena opened in 1923 as the nation’s first field house and transitioned to an ice arena in 1973. It is named in honor of Fielding H. Yost, Michigan’s legendary football coach and athletics director. While the old barn has undergone numerous renovations over the years, Yost has never lost its blue-collar feel and is still considered one of the toughest places for visiting teams to play. Yost has hosted NCAA tournament games five times in its history, most recently in 2003.